Ladies and gents, I am a beach blogging babe. Or rather, I am a beach babe who will not be blogging again until Wednesday. Por que? Because we flew to Boca Raton yesterday to celebrate JohnnyMac's birthday. BUT, in the spirit of all this delectable, I want to share one of my favorite cocktails for all of you especially those enjoying some Memorial Day Weekend playing. I have shared this before but it is good enough to share again. 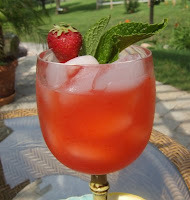 We went to a strawberry farm last week and I am growing my own basil so this cocktail which I made plenty of on Thursday night for the birthday festivities, was better than ever. This will certainly wet your whistle during the heat wave of summer. Perfect for parties, lazy afternoons, or the rare opportunities you get time alone. Goodness awaits...make yours soon. And for our friends who prefer the virgin-version, this is (almost) just as good sans Vodka. Loosen 4 or 5 basil leaves and muddle with a bit of sugar and water. I also muddle a few of the berries. Combine all ingredients, mix, serve, and try not to claim it "didn't turn out well" so you can keep it all to yourself. Have a gorgeous holiday weekend. And don't forget to enter the gorgeous art giveaway I am hosting with Modern Bird Studios. Contest ends Monday night. Winner announced on Wednesday, June 2. Ohh I want that right now and its not even 7 am! yum...love me some strawberry lemonade so...this is gonna be good. have a great time at the beach! It's not strawberry season here at the mo', but will store this one away for future. Basil and strawberries? Who would have thunk it?! Hope you have a lovely time in Boca Raton and hope to hear all about it on your return. I have been on a cocktail-making kick lately...that looks promising! 826am here...and i might have a virgin version! Looks yummy! I don't know why, but the idea that you went to Boca Raton just cracked me up. Maybe it's because all i can see in my head is Seinfelds parents in their condo in Boca. It evokes images of old people in bad polyester pants and bermua shorts. But i'm SURE you will not be hanging with any of them. Have a fabulous vacay! This recipe looks as if it will "hammer" quite nicely. Happy vaca. I'm wanting a pitcher of that right now...and I'm the only one here! Looks like the perfect summer drink! I could force myself to drink that...a, yes I could!!! Enjoy the beach!! hope you get some beach time in between all the rain we're having this weekend. Have a fabulous time at the beach! Anything made with Vodka is my friend! Thanks for this recipe - it looks amazing! ...and now I'm drooling onto the keyboard. That looks amazing. I think I need one (or two) of these in my life. Sounds delicious! Have a wonderful weekend celebrating the Original J Mac's birthday! Enjoy your weekend with JohnnyMac! Sounds yummy! Hope you enjoyed the holiday! Sounds lovely! All of it! Hope you had a FAB time!!! You had me at Vodka. Hope you had fun! I hope you are having the best vacation ever! This would be perfect with some of the basil I'm growing in my little herb garden...and vodka...hello, lover! Hope you are having a blast, miss you! Hubby had a "John Daly" at a bar Friday after work...Pink Lemonade and Jerimiah Sweet Weed Tea. He liked it A LOT so he stopped to buy the stuff on the way home. Could NOT find pink lemonade so he made do with regular lemonade. I got the genious idea to make simple syrup and while it was warm dump in muddled strawberries and then strain the whole lot into fresh squeezed lemon juice and add water. have a great time and thanks for the new summer cocktail! Oh that sounds so refreshing! Much better than the vodka/Crystal Light concoction I drank over the long weekend! Now that's a sumer mixed drink I can get behind. now thats a nice drink. So your blog title totally caught my attention! Every Wed I post a "Wednesday Weekend Warm Up" cocktail recipe. I had to stop by to see whats going on over here! Please stop by my blog 'imagine' and check out my fun giveaway! well yes, this would have caught my attention. however. on sunday evening i had approximately 19 vodka lemonades and so this currently makes me clench a lil bit. i'll save it, tho. i'll save it.